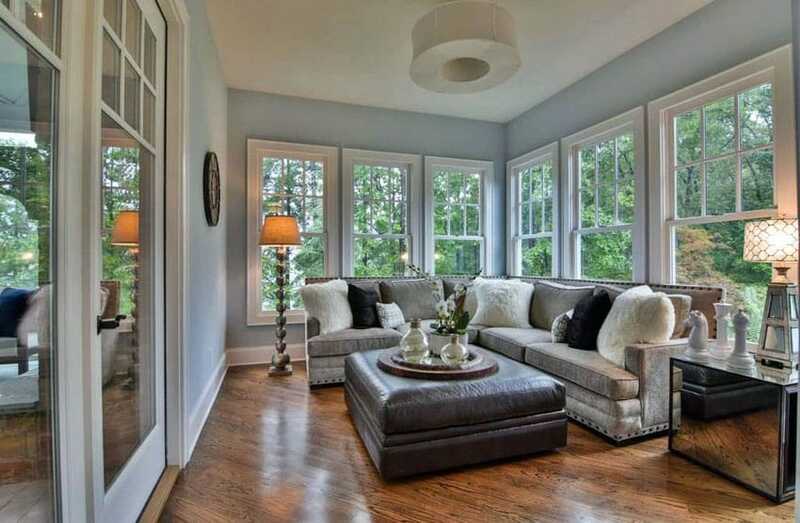 Welcome to our gallery of beautiful sunroom designs featuring a wide range of room styles. A sunroom can help enhance your home and allow you to enjoy the outdoor areas for much longer from the comfort of indoors. As a combination between a living room and a patio a sunroom addition can be a great way to increase the resale value of your house as well as create a spot you and your family will enjoy. Most people just can’t get enough of the sun. It uplifts spirits, help us get that glowing sun-kissed tan, and can make even the bleakest of home spaces feel roomy and bright. In interior home design, using natural light – the term most commonly used is “daylighting” – not only has numerous aesthetic benefits. 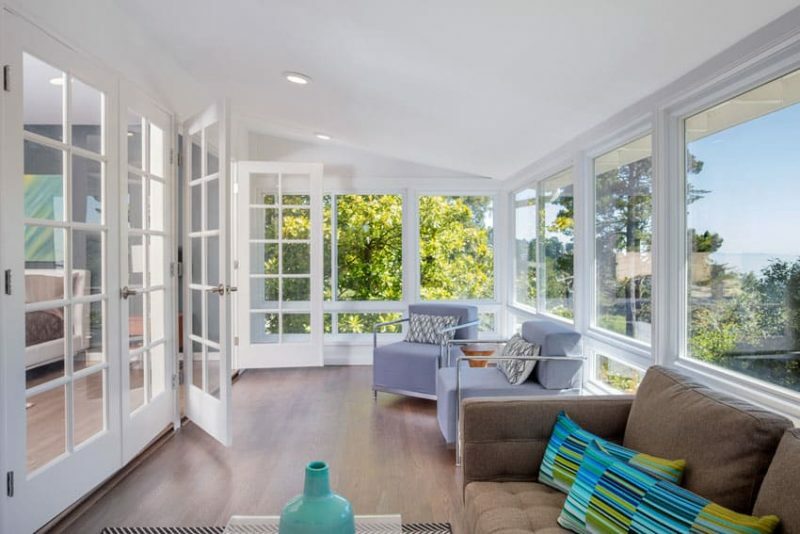 Research has also proven that daylighting has a surprising amount of health benefits as well. The Benefits of Sunrooms. Sunrooms are structures that are integrated into or separate from a main building that primarily have two uses – sunlight and views. They’re most often found in homes, but, as we’ll be covering later on, they’re also integral parts of many offices, restaurants, and other buildings. The 1960s saw a sharp spike in construction companies offering enclosure systems for patios and decks. 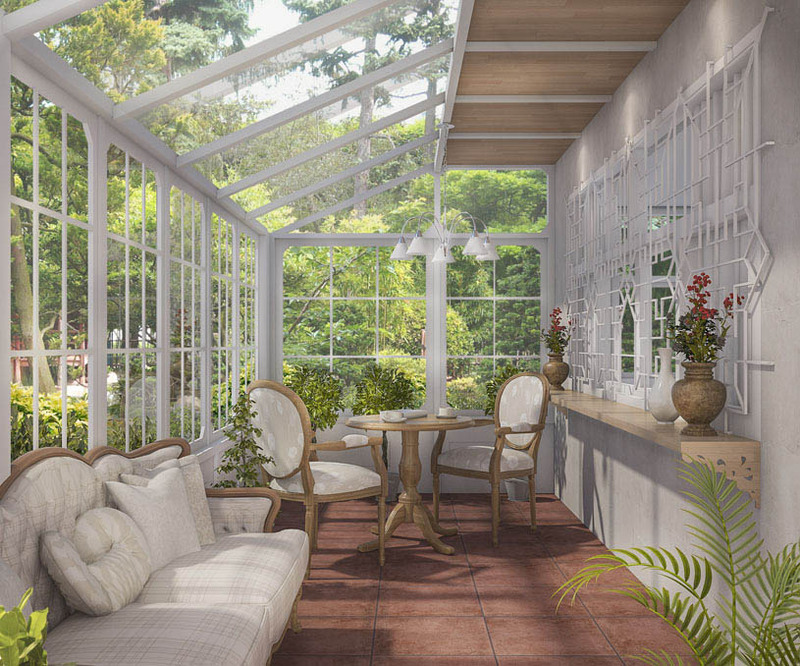 As building technologies advanced, the sunroom as we know it today slowly emerged. 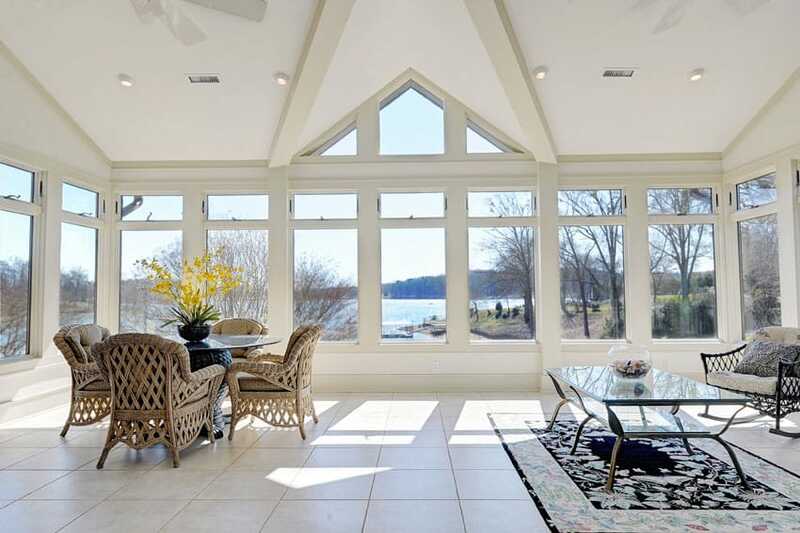 The contemporary sunroom now comes with different forms of framing systems, glass types, wall and flooring materials, and choices of stylish furnishings. The price of a Sunroom varies depending on several factors. 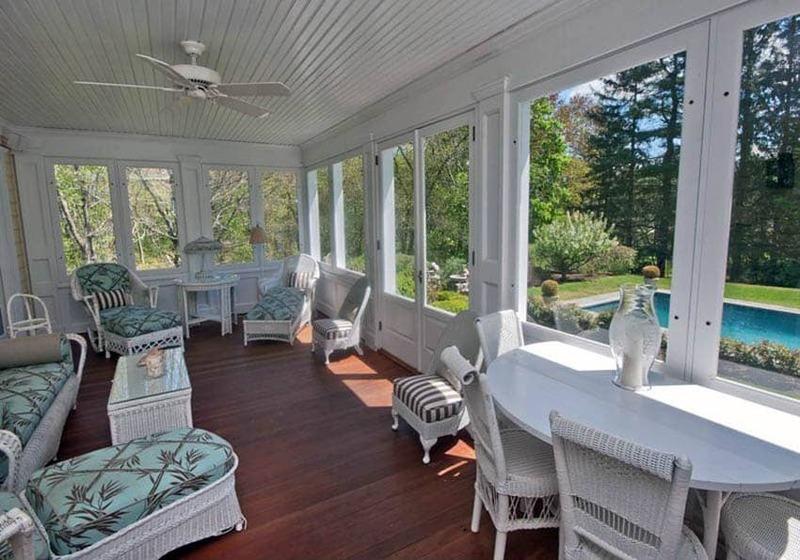 Sunrooms are going to set you back a reasonable $360 per square foot. This is working under the assumption that carpenters will charge $70 an hour, electricians will charge at the $65 – $90 per hour range, while painters will charge around $20 to $40 per hour. For more complex structures, you might need to hire other professionals such as interior designers, architects, or engineers. Keep in mind that more hires also means a higher cost. Some states or cities will also require you to secure certain building permits for sunroom construction, so there’s also that to consider. Average prices for full-enclosure sunroom structures will cost upwards of $15,000. Of course, as with all construction jobs, a big part of will depend on the types of materials and construction systems you might prefer. Going for a wooden framing and glazing system will have vastly different price ranges than say, PVC or aluminum framing. You could also go with pre-fabricated sunroom additions that, although initially more pricey, will ensure quality, straight from the factory, and state-of-the-art building materials and will have a shorter installation time. With all the savings from possible man hours and construction and labor costs, pre-fabrication might be a more economical solution. This is going to cost around $22,000. Other factors to consider are whether or not you’ll be adding the sunroom as an attached structure to an existing wall or as an addition to an already existing porch or deck. Wall demolitions and subsequent retrofitting will cost time and money, but might just provide you with the sunroom that will be worth that extra effort. For a clearer view of your options, a good rule of thumb would be to always ask for estimates. Ask from your local laborers, designers, suppliers, and hardware stores. A good understand of all your possible cost options would help you prioritize what you would really want from a sunroom, which will in turn save you a lot of money in the long run. Sunrooms can generally be grouped according to their intended usage throughout the year. Some homeowners would prefer using their sunrooms in three of the four main climatic seasons. Winter is generally too harsh of a season for their use of the sunroom, and so they’re fine with utilizing the space during the spring, summer, and fall months. Sunrooms used during those three more comfortable months are called 3-season sunrooms. Other sunroom designs, on the other hand, have employed sufficient weatherproofing strategies and active and passive HVAC systems to make it so that they can be used by homeowners and their guests all year round. 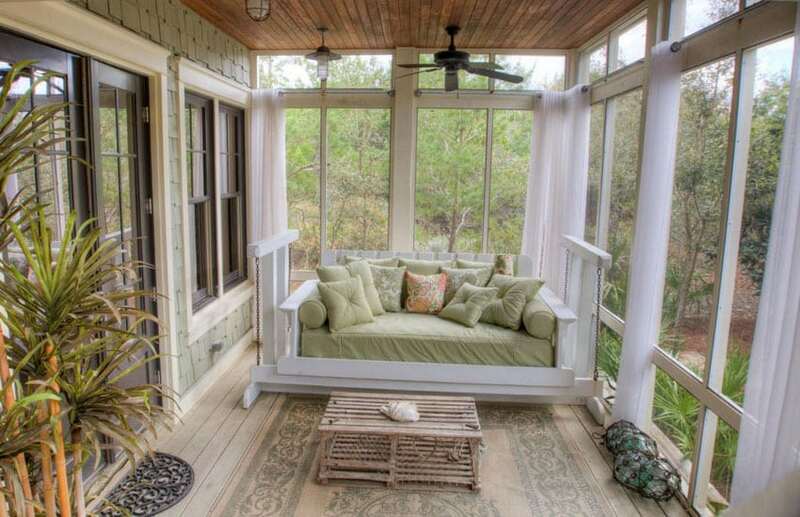 These are called 4-season sunrooms. The main differences between these two types of sunrooms lie in their climate control – the types of glazing they use, insulation (or lack thereof) in the ceilings and walls, as well as HVAC systems. 3-season sunrooms, depending on their size and complexity, will cost about $10,000 to $70,000. 4-season sunrooms, with their more stringent weatherproofing design considerations, will cost a bit extra at $20,000 to $100,000. The choice of furniture for sunrooms will, as with all designed spaces, depend on its intended use. Typically, sunrooms are used as hospitable accommodation spaces for home guests. In cases like that, sofas and lounge chairs, side tables and coffee tables are usually what can be seen decorating the room – the typical fanfare for contemporary living areas. For office sunrooms, tasteful choices of arm chairs and work desks will be expected. For play or lounge rooms, day beds and carpeted floor areas are often used as well. Whatever the choice of furniture may be, extra care should be taken in ensuring that furniture materials can take the constant exposure to sunlight in a sunroom. Try to avoid any woods, paints, or other materials that might have an adverse reaction to constant sunlight exposure. At times, discoloration and material deterioration occur due to UV radiation. A good workaround for these types of materials are effective UV coating finishes or windows that have UV-protection capabilities. 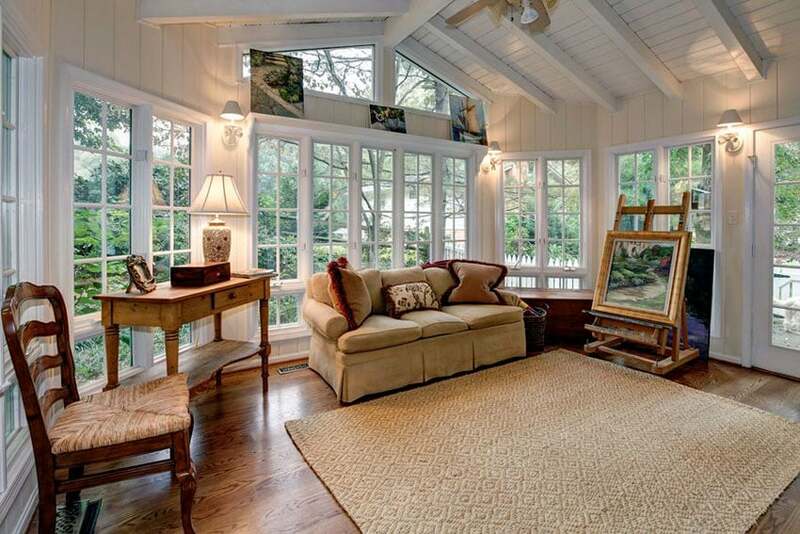 Sunroom furnishings give an extra bit of accent to the space by providing it with character and aesthetic style. 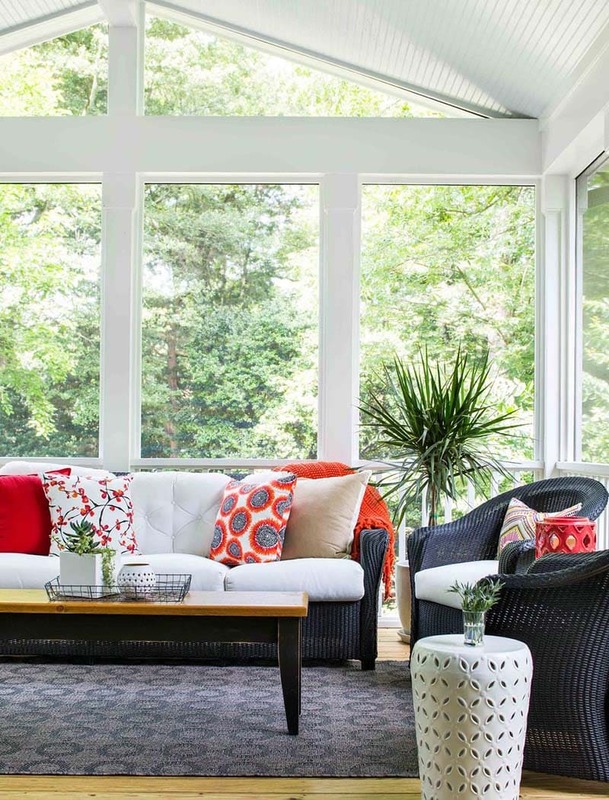 This coastal sunroom design uses weave sofas and lounge chairs as well as bright splashes of red and rich orange on the throw pillows and sofa blanket cover. As an interior space but also, in a sense, an outdoor space, sunrooms have the unique privilege of being one of the select few spaces which can accommodate almost any type of flooring finish. 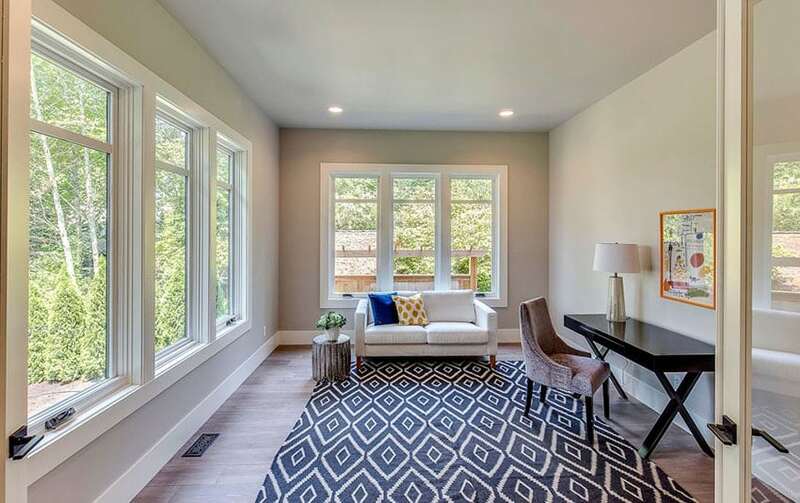 Depending on the type of subfloor system and construction, one could choose to use stone tiles, ceramic tiles, wooden flooring, or carpeting. For simple flooring needs, sunroom additions will need minimal site preparation before construction. For more complex or structurally demanding flooring such as heavy or dense stone tiles or solid wood floor boards, foundation slabs or flooring joist systems might be needed. As with the furniture choices, keep in mind the copious amounts of heat and UV rays the room will be getting from the sunlight. For most homeowners with home-improvement ambitions, sunroom additions are a popular choice for really upgrading the value of a living space. Typically, additions such as these are added to already existing decks, porches, or lanais. 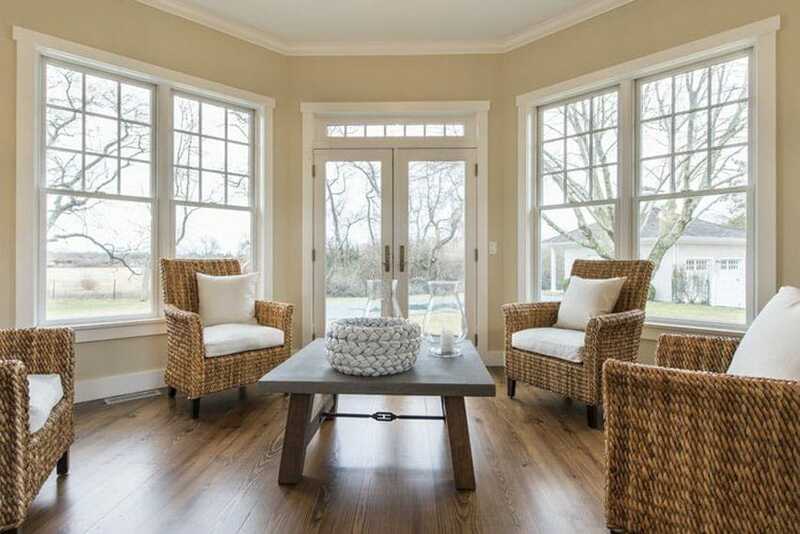 However, it is not uncommon to see sunroom additions made from the ground up. Granted, there will be extra cost considerations for flooring systems, possible wall demolitions, and renovations to the existing adjacent spaces, but for the most part, the extra comfort and space from a new sunroom is well worth the extra budget. This sunroom addition design takes full advantage of its amazing background scenery by choosing to go with full glass glazing on all its walls and a part of its roof. The prolific use of greenery can also be seen in the room itself, with shrubs, potted flowers, and indoor plants being used to decorate the space. Sunroom additions can be used as closed and covered wooden decks, with all the amenities any outdoor wooden deck would have. Here we have a swing sofa, perfect for lounging around on a beautiful lazy Sunday afternoon with family. Without sacrificing the amazing veiws, covered deck sunrooms keep out any unwanted natural elements or insects from spoiling your day. One could opt for the more contemporary look by going for sleeker, more modern furniture choices and somber color palettes. This black and white sunroom addition also employs flowing white drapery for sufficient amounts of privacy when needed. Roller blinds also work wonders for sunrooms. 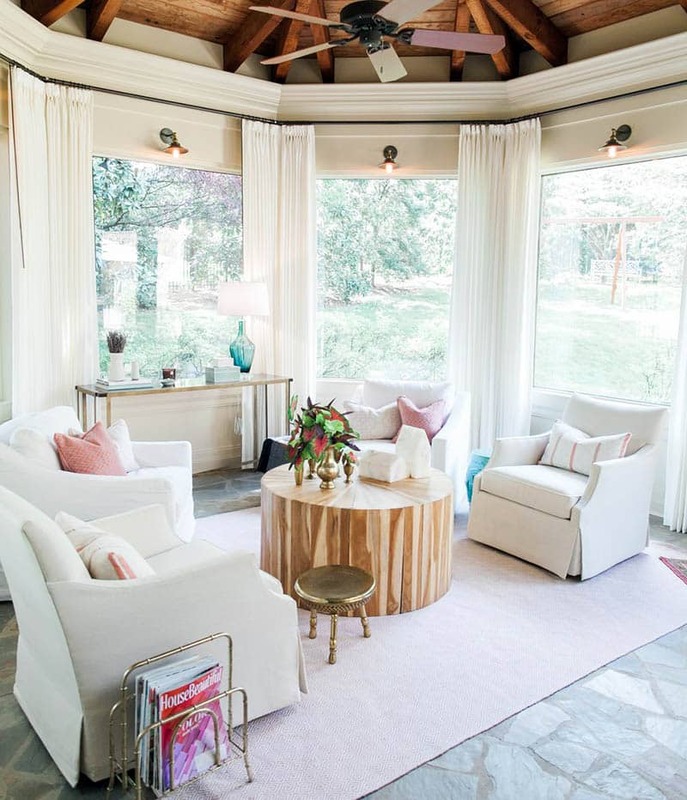 This cozy, more personal take on sunroom additions has sheer rollers that still take in plenty of natural sunlight even when fully rolled down. Sunrooms can be added adjacent to already existing home spaces. 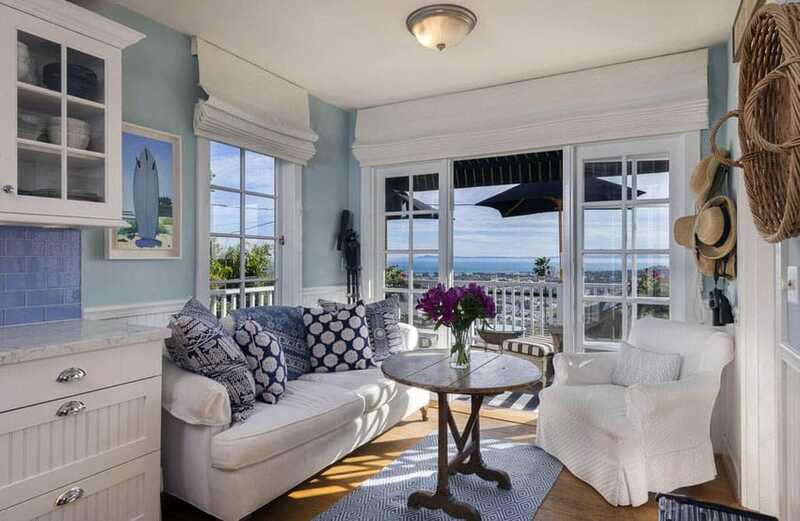 This particular example opens up to a large veranda overlooking a breath-taking view of the city and sea horizon. Employing bright, neutral colors really serves to complement the natural light in terms of making a sunroom feel open and spacious. This homey sunroom space uses subdued yellow tones with white and earthy brown highlights on its furniture, walls, and windows. Sunroofs are great additions to any sunroom design. 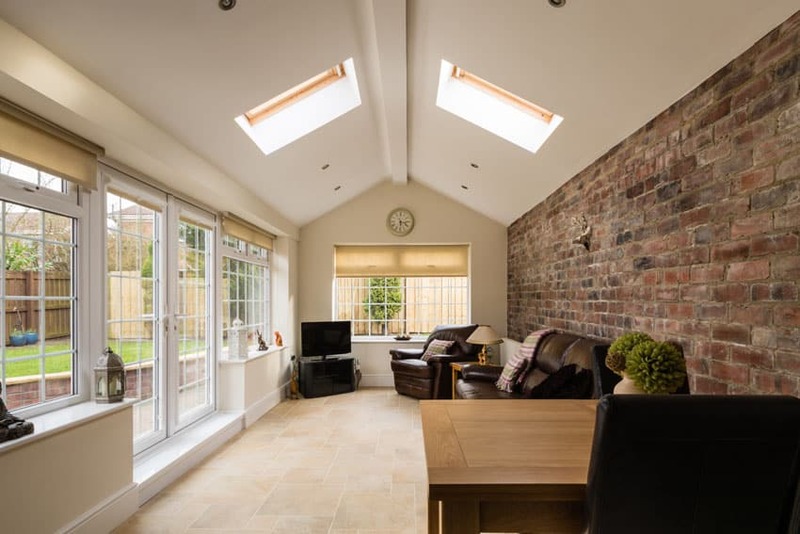 This space uses beautiful french doors and windows, a cathedral ceiling with symmetrical sunroofs for extra sunlight, and a nice brick wall accent at the further side of the room. 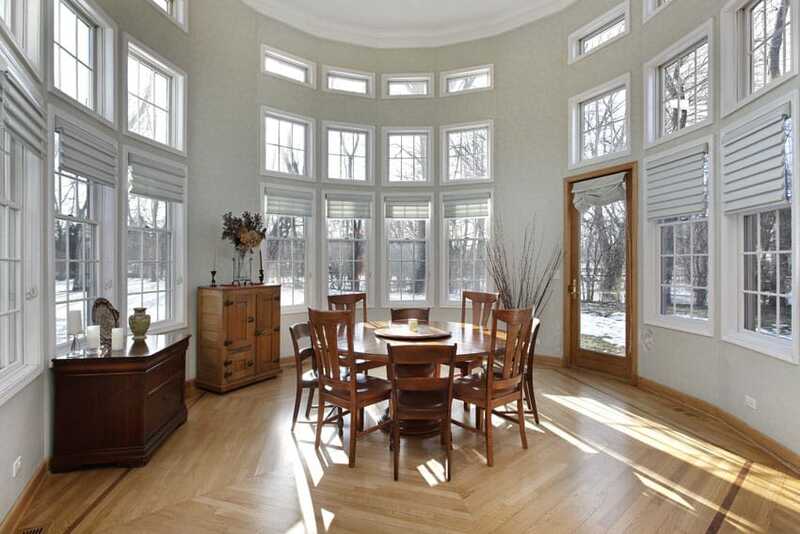 Homes in heavily wooded or forested areas benefit a great deal from sunrooms. They get the nice view while taking advantage of the forest’s natural shade to regulate the amount of sunlight coming into the home. For ground up sunroom constructions, a popular choice is the use of prefabricated sunroom kits. 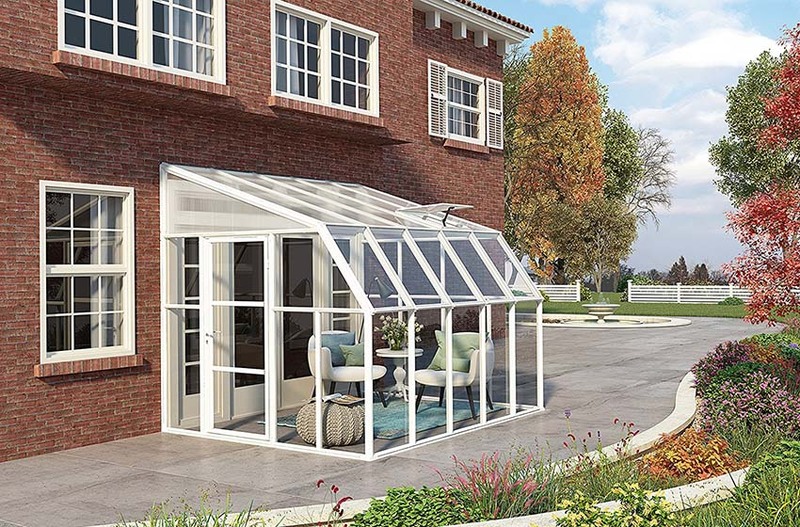 Although a bit more pricey than on-site construction, sunroom kits offer all the best, factory-tested materials and enclosure systems, as well as boasting significantly less installation times than on-site builds. Most of these sunroom kits are DIY, giving you an option of building it up yourself to save on labor costs. Ease-of-construction is a big factor in the design of these kits. They use easily handled glazing and framing materials such as PVC or aluminum frames. These lightweight framing materials are a breeze to build up and install but also provide durable and low-maintenance structural support to the windows and roof of the sunroom. Quick building time and light weight but effective framing construction are the few reasons homeowners might consider going for pre-fabricated sunroom kits. 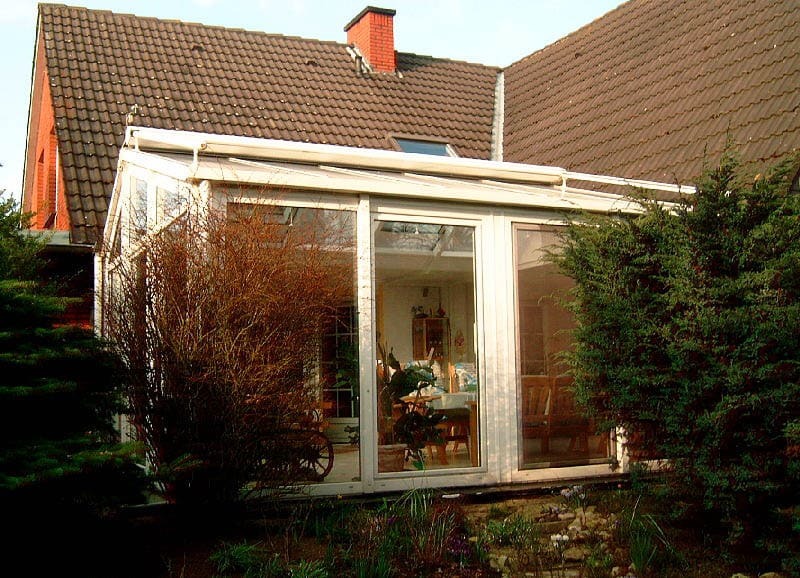 Most sunroom kits can be installed onto already existing terraces, balconies, or verandas to great effect. 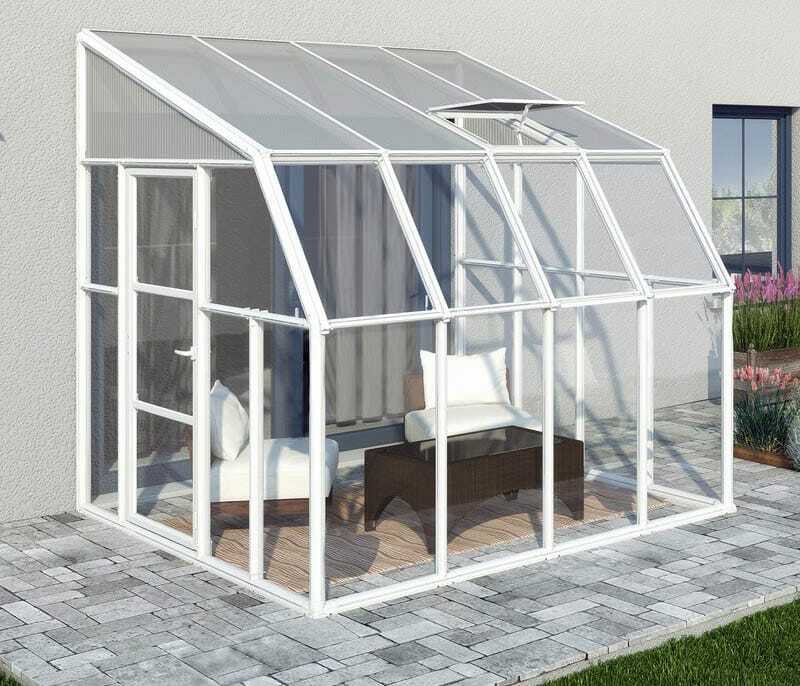 Their glazing and the types of glass the use often create greenhouse effects and can be utilized as passive heating systems for the home. 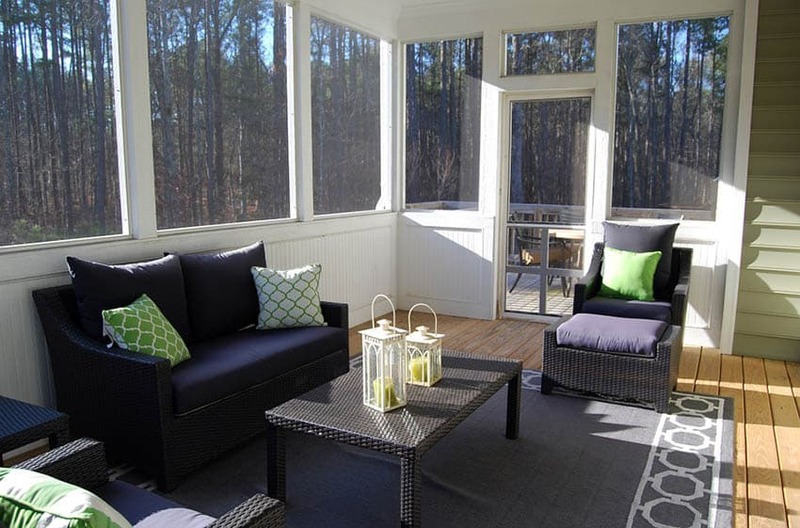 These sunroom kits come in various sizes – from small 8′ by 8′ additions to medium and larger scale spaces. Their modular characters are not only convenient, but amazingly versatile for almost all types of sunroom needs. The most common uses of sunrooms are as entertainment or lounge spaces for homeowners and their guests. As such, sunroom uses vary from living areas to small dining spaces, lounge areas to view decks, and even playrooms to cozy reading nooks. 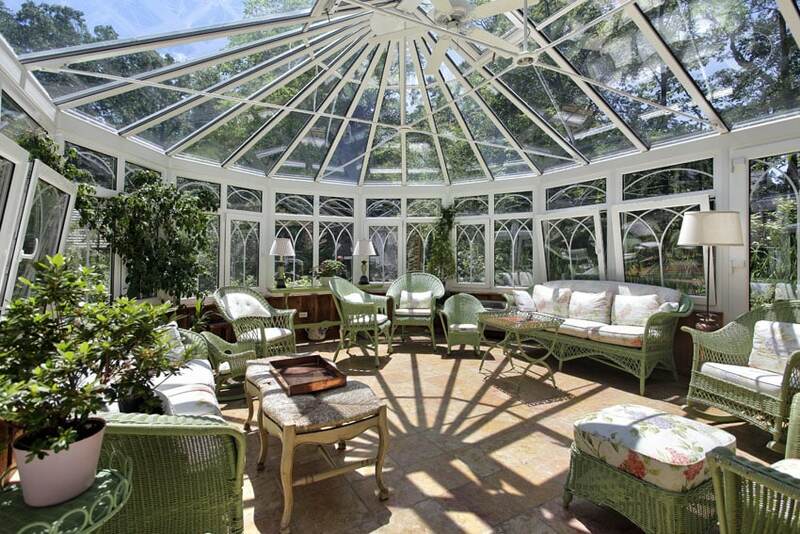 Larger and more lavish sunrooms serve as the main living rooms or accommodating spaces for house guests. This example even has a fireplace in the space. Homeowners and designers can choose to go creative with the style or taste of aesthetics in home sunrooms. 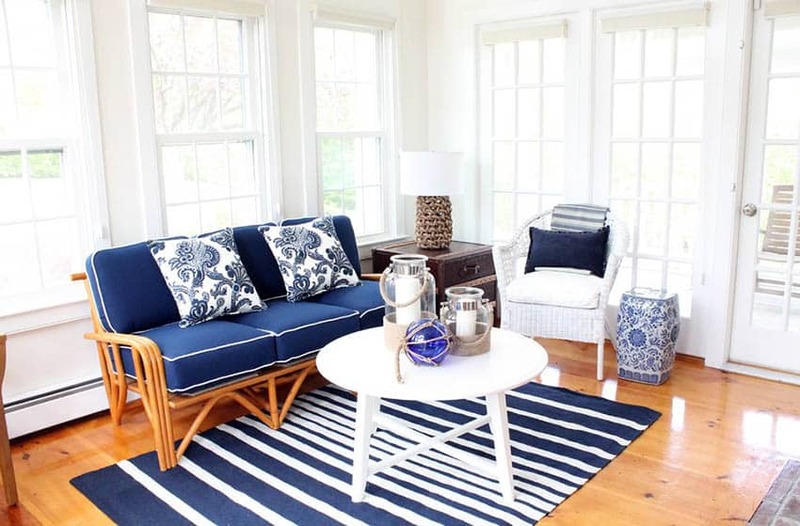 Coastal style chic with navy blue and white color palettes are popular choices for many sunroom living rooms. For lakeside abodes, it would be a shame not to take advantage of the amazing views of the lake and surrounding forests. Large sunrooms next to such good vistas do well to use large view windows and clerestories to really take in the surrounding landscape. During wintertime, all-season or 4-season sunrooms are used to take in warmth and light from the sun as well as giving you good views of the beautiful snowfall all around. 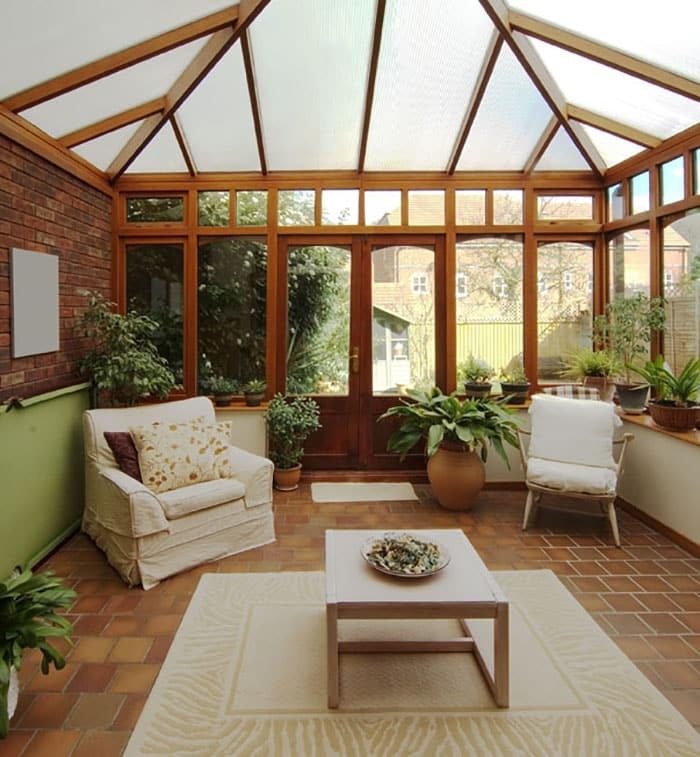 More tropical climates give even better warmth and light for home sunrooms such as this. The choice of using wicker weave furniture and rustic wooden tables also add a nice touch to the room. Modern living room stylings can be used in many contemporary living room sunrooms. 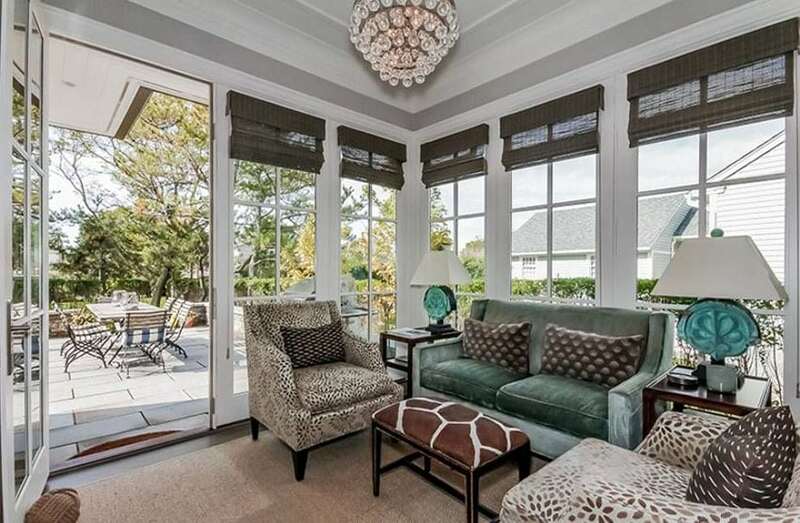 The modern and comfortable furniture in this stylish sunroom really make the space. 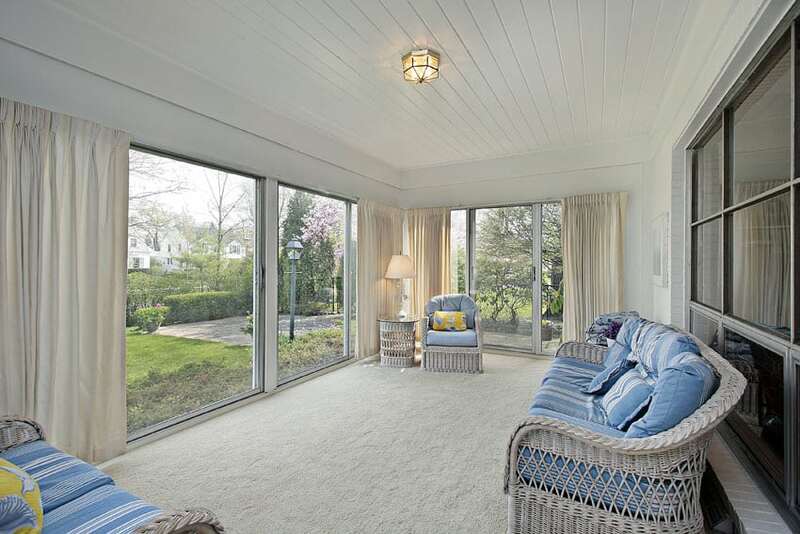 Carpeted flooring can be a nice touch to sunrooms. It makes for a cozy and welcoming atmosphere and the addition of wicker furniture complements the general homey feel of the space. Strong, rich wooden finishes can add a lively glow to any home sunroom. The white frames of the french windows and doors as well as the stark rectangular pattern of the white tile floor also offer a good contrast to the browns and tans of the room. Clean, white accents will forever go well with strong wooden tones. 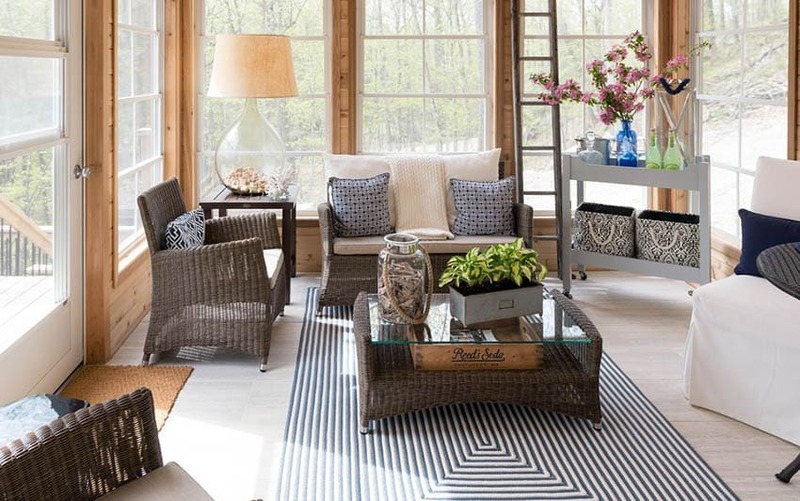 The wicker lounge chairs and the central accent table are oriented in a conversationally conducive radial layout, making this sunroom an ideal location for conversation with friends. Poolside patios can be made even more usable by adding the extra benefit of them being covered sunrooms. It also offers homeowners a space to dry off after a nice dip in the pool. Extra ceiling space added in sunrooms helps regulate the temperature of the room by letting warmer air rise up to the top. 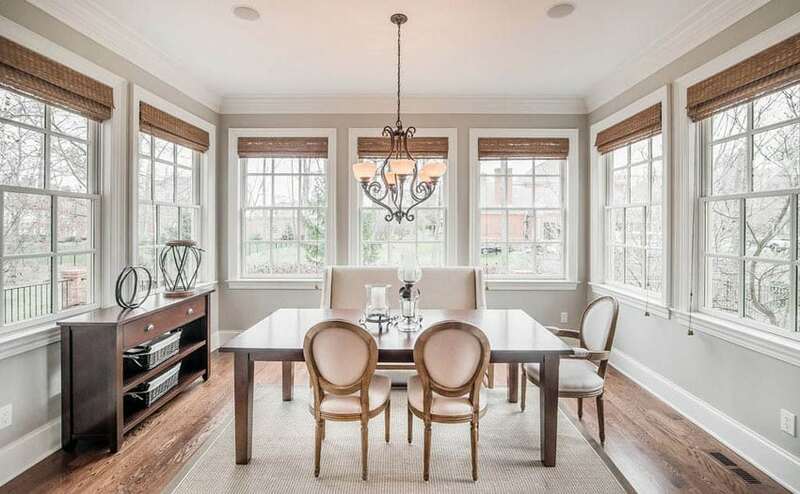 This particular setup, with large french windows and a gable clerestory window set lets in ample amounts of warmth and light. One can choose to let sunrooms act as entrance vestibules for side or back entrances of the house. It serves as a nice transition space between the outdoors and the interior private spaces of an abode. Sunroom designs can also be side-wing additions to main house areas; they can serve as comfortable lounge spaces and viewing decks. The style of this particular example, with the large L-shaped sectional couch as well as the central accent ottoman, really makes it feel upscale and well-designed. Other than as living rooms, home sunrooms can also serve as spaces that cater to the younger members of the household. 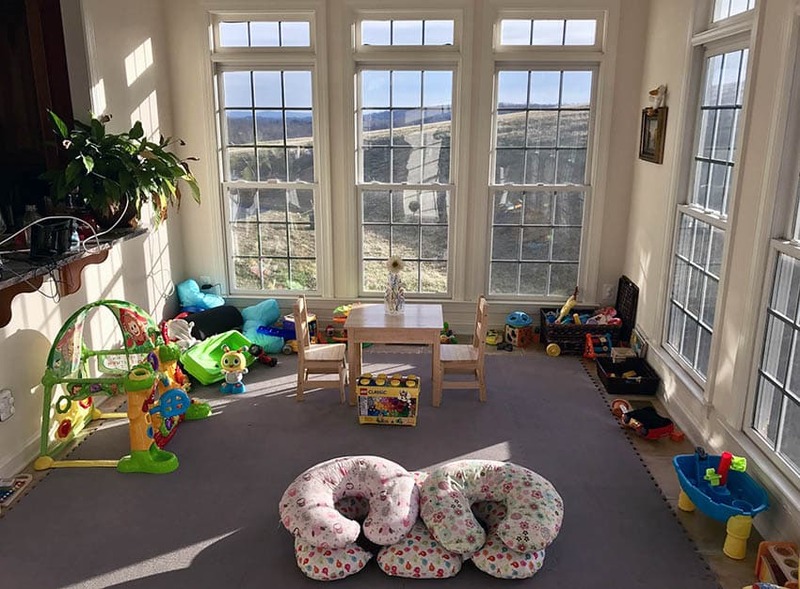 Letting children play in a sunroom playroom with their toys and rubber floor mats help them soak in a healthy amount of sunlight and help the children feel relaxed and be in high spirits. 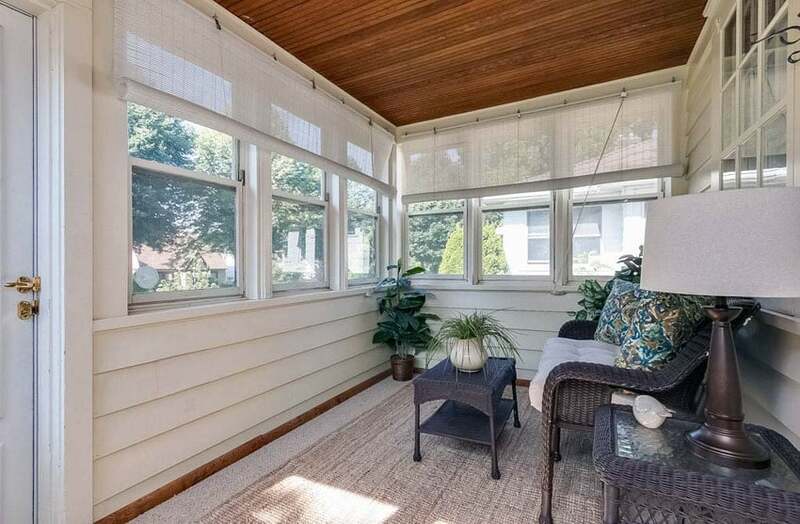 This sunroom serves as a nice view deck of the backyard garden. It opens up directly onto the outdoor hallway which really gives you a nice vista of the surrounding flowers and landscaping. 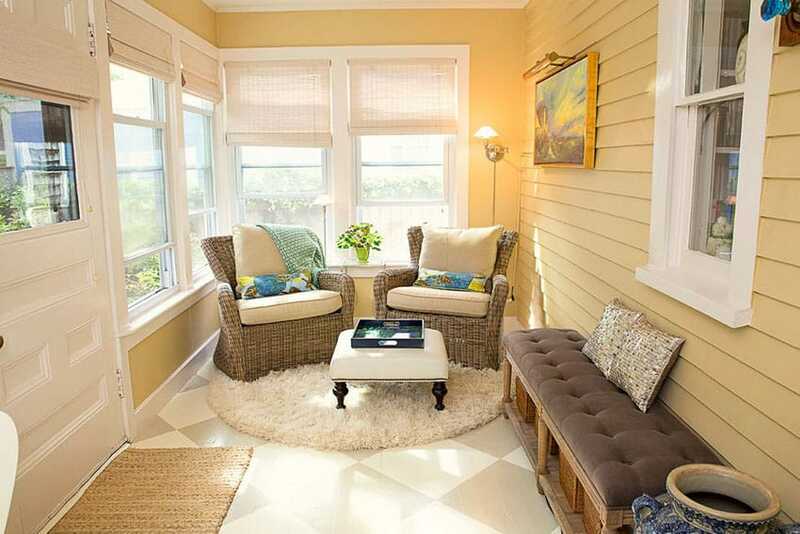 Coastal style sunrooms feel at home, as the name implies, in coast-side houses. The ever-popular navy blue and white color palettes have complementing hues with the picturesque views of the beach and sea. 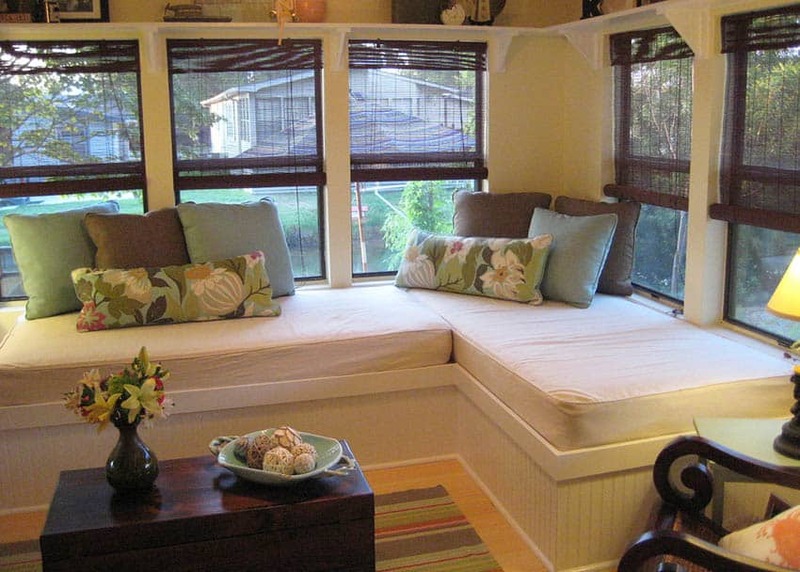 A small sunroom with corner window seat is perfect for one that might prefer to use it as a cozy spot for reading nooks or as an intimate lounge space. These seats give you nice views of the outdoors and are perfect for quite evenings alone with your thoughts. 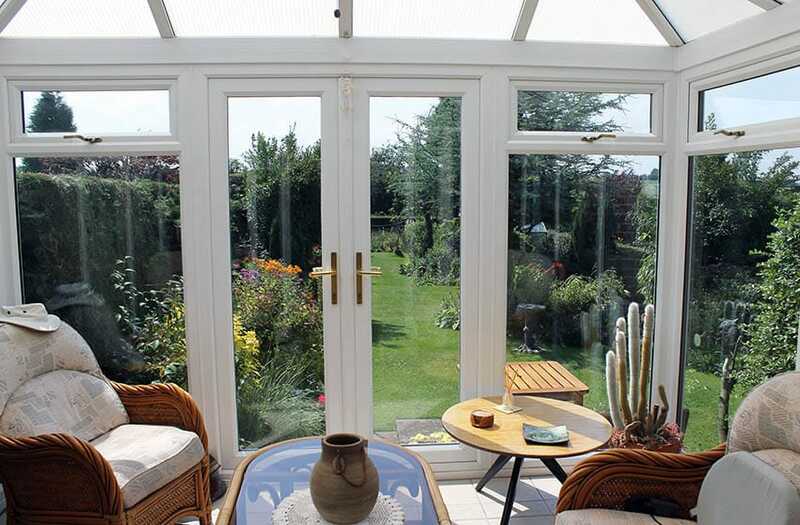 Home sunrooms can very well function as dining spaces as well. This is perfect for families that prefer a nice surrounding view of the outdoors when they’re having their breakfast or dinners. 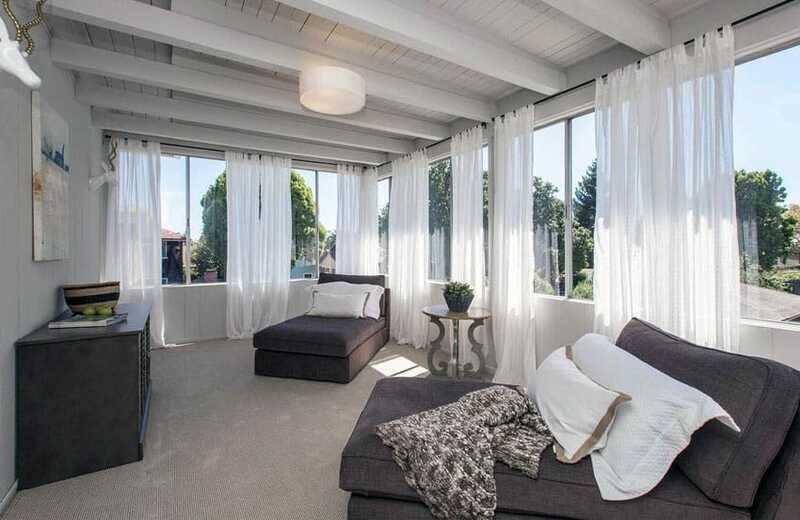 Patio sunrooms are dedicated spaces for lounging or accommodating guests. These come in the form of either separate structures from the house altogether or side wing extensions with large floor spaces. 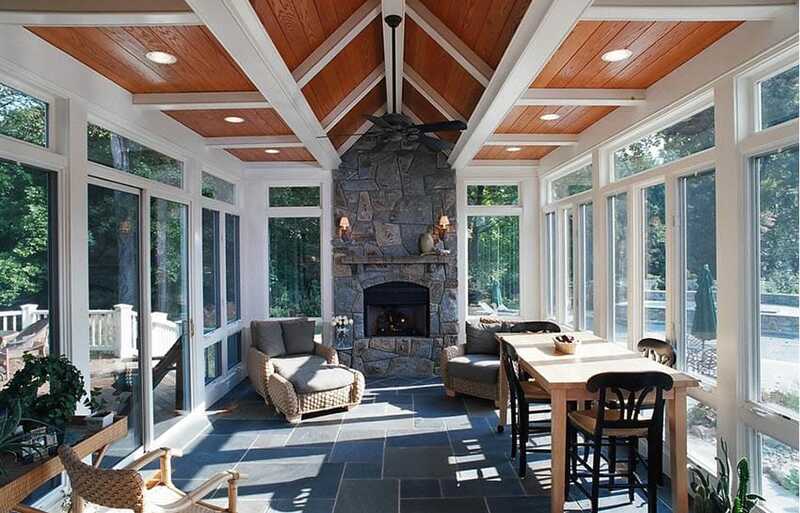 These types of sunrooms typically have more complex ceiling and roof designs. A lot of them use obscured or low-E glass panels to let in as much light as possible while keeping out UV radiation. Others employ high vaulted or paneled ceilings for aesthetic value and air space. 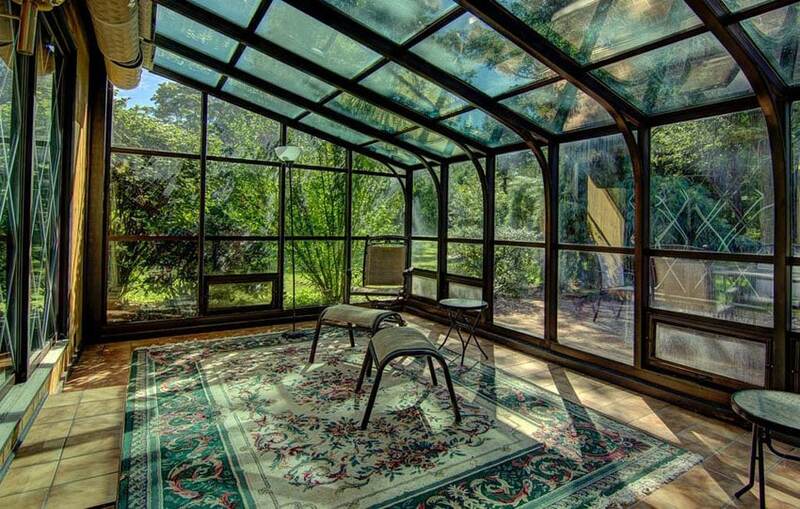 Garden patio sunrooms are an amazing way to entertain and accommodate guests or intimate social gatherings. The place itself is a nice conversation piece for any homeowner. Obscured glass are commonly used for any patio sunroom designs that might want to use glazing as their roofing material. It lets in just the right amount of light and warmth according to your home’s needs. 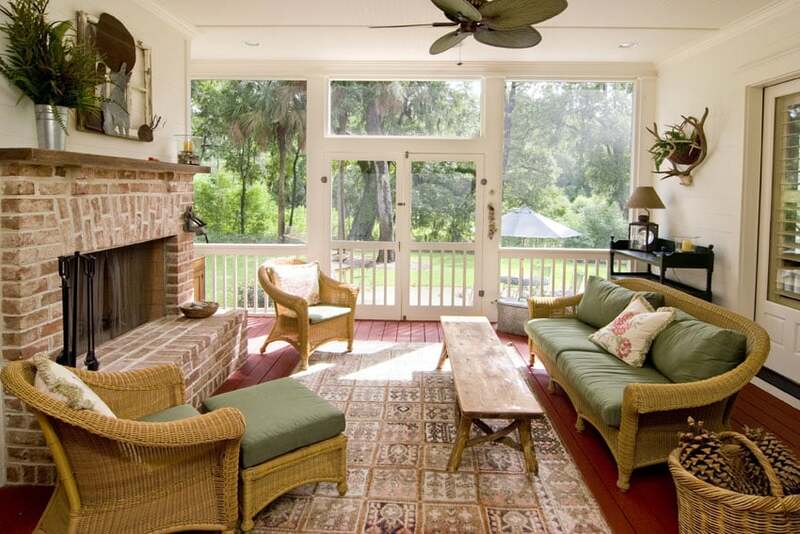 Vaulted ceilings, slate floors, and stone fireplaces are perfect for 4-season patio sunrooms. These serve as cozy little respites from the harsh colds of winter, while giving you amazing view all around. Single-slope shed type roofs with transparent glass panes as roofing materials are perfect for patio sunrooms that are fronting beautifully forested areas or gardens. With the additional shade that the surrounding vegetation provides, taking in too much sunlight should seldom be a problem. Tall cathedral ceilings, bright and rosy furniture and furnishings, and picturesque views from surrounding picture windows are always an amazing combination for any patio sunroom. 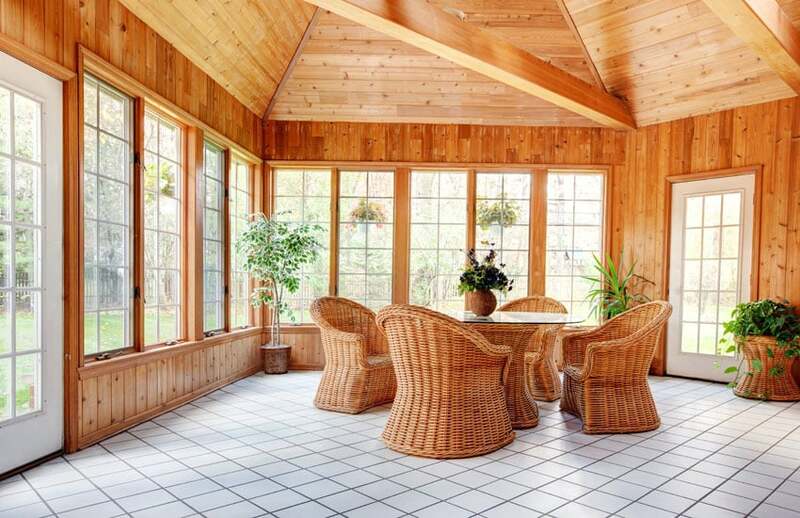 Most sunroom designs do well to be directly connected to outdoor lounge or dining areas. The proximity of related spaces is integral in designing a good layout for any home. Although typically used as living spaces, sunrooms are also often used for working or office rooms. Sunrooms are especially useful for desk work that might need plenty of natural light. On the other hand, good outdoor views and an open, airy feel does wonders for any office worker’s productivity and well-being. Another great benefit of a sunroom home office is the ability to quickly transform it in to a double office. A sunroom typically has a floorplan that allows one to set up a working area on either one or two of the free walls. This layout is ideal for couples who share an office or desire an fresh space for contemplation or creative work. Open, daylight-utilizing sun room offices are perfect for accommodating any office visitors when comfort and relaxation are key. A welcoming environment is always a good idea when discussing business prospects. Most creative types absolutely adore a good helping of the outdoors when working. 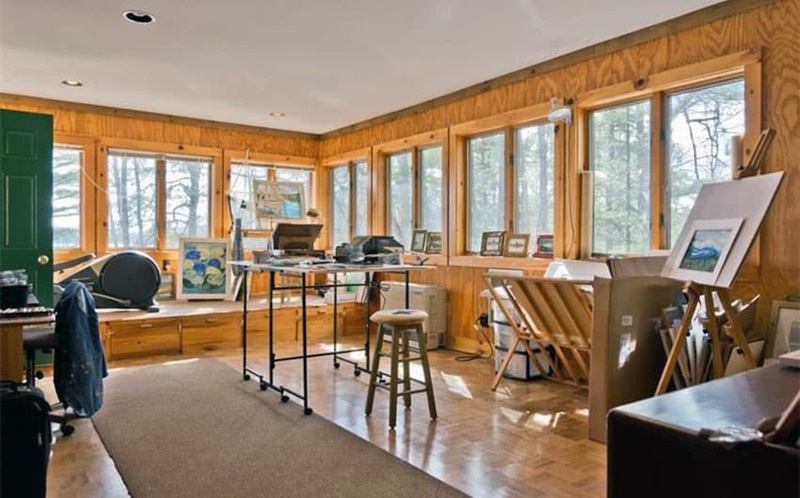 Large open plans used for sunroom offices such as this one are also amazingly conducive for creative work and really lets artists bring out their best. Subdued, minimalist layouts are also quite useful for home offices set up in sunroom spaces. It’s always nice to have a small nook in a space with plenty of sunlight for desk work that requires focus and attention.